Join some of the wildest party animals at our mobile casino, quite literally, as you take part in the five reel Wild Birthday Blast slot game. We aren’t even sure who’s hosting this bumper birthday party, but one thing we are sure of is that it isn’t one to be missed. You could be presented massive fortune, and you’ll surely be celebrating long into the night if you are lucky enough to land the enormous jackpot available in this game, it will probably end up feeling like your birthday with the gifts the slot has to offer! 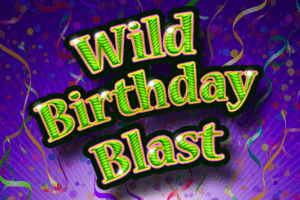 The Wild Birthday Blast slot is exactly as the title suggests, you will have yourself a blast, and it is sure to be wild. On the reels, players will be humoured by the party animals dancing away in celebration. You will see an elephant with a party hat on, a parrot holding a sparkler as well as many other hilariously featuring symbols. The surprise into the party itself may have been tame, but you will certainly be startled by the bonus features you could land for yourself. Anyone is invited to the party, so be sure not to miss out, with bets ranging from £0.01 to £60 per spin. What’s a birthday party without a party horn? People who attend parties and see them are guaranteed to start playing around with them. So it is very fitting as the wild symbol in this game. The special Wild Birthday Blast slot symbol can substitute for all other symbols in the game (except the free spins icon), enhancing player’s party experience by creating bigger and more valuable combinations! Are you enjoying yourself? A typical question at a birthday party, but when you play the Wild Birthday Blast slot game the answer to the question will be an undeniable yes if you are lucky enough to land the free spins this game has to offer. The symbol to trigger this feature could not be any more obvious, and it is the symbol that says ‘Free Spins Bonus’ on it! Players can be rewarding with 10, 15 or 20 free spins when 3, 4 or 5 of these symbols appear respectively. During the free spins, all prizes will be doubled and added to your total funds after the free spins have finished. So, ask yourself that question again? Although we’d never admit it, secretly the only thing we look forward to about a birthday party is receiving gifts, but at this party, it doesn’t have to be a secret as you could substantially increase your party fund when the surprise gift box appears. Wrapped like a typical present at a party, there can be many gift boxes appearing after a spin, and they will randomly reveal a symbol from the paytable, this may, in turn, enhance your winnings from that spin! There is no doubt that the Wild Birthday Blast slot is one of the best birthday parties of all time! If you are a fan of online slots with a party atmosphere then be sure to check out Spinata Grande slot or Birthday slot.